EL SEGUNDO — The unspoken words told Lakers coach Luke Walton that Lakers guard D’Angelo Russell and Lakers forward Julius Randle would not sulk about sitting out in fourth-quarter stretches. Their effort in Wednesday’s practice showed Walton they will channel any frustration with diminished playing time productively on the court. Only 10 days ago, Walton had praised Russell and Randle for their improved play, work habits and consistent work habits. Though Walton argued their performances mostly dictated the Lakers’ success, Russell and Randle sat out final 19 minutes and 33 seconds of Tuesday’s 127-121 loss to Denver Nuggets at Staples Center. Russell has five points on 2-of-9 shooting and three assists in 17 minutes, concluding a five-game stretch in which he has shot 32.8 percent from the field and 11.1 percent from 3-point range. Though he did not talk after Wednesday’s practice, Russell criticized his play after Tuesday’s loss and praised Walton for sitting him. Yet, Walton said he did not bench Russell as a way of “dangling a carrot” to motivate him. Instead, Walton depended on other young prospects with a steady forward in Brandon Ingram (15 points, five rebounds, four assists, three steals) and an emerging center in Ivica Zubac (11 points, 13 rebounds, three blocks in a career-high 26 minutes). Walton depended on a small lineup that featured on Lou Williams’ consistency (scored 14 of his team-high 24 points in the fourth quarter), Nick Young’s prolific scoring (22 points) and Jordan Clarkson’s aggressiveness (19 points). Meanwhile, Randle had a blend of intriguing play (seven points, seven rebounds, seven assists) with ineffectiveness (2-of-8 shooting, five turnovers, four fouls). In the last five games, Randle has averaged 8.2 points on 34.9 percent shooting. Still, Randle admitted afterwards he wants to play in the fourth quarter. So, Walton noticed Randle had a “nice edge” in Wednesday’s practice. Randle said he wanted to “try to build so it translated” into Friday’s game against Indiana at Staples Center. If not, Walton said he will not hesitate closing out with other players that fit that description. 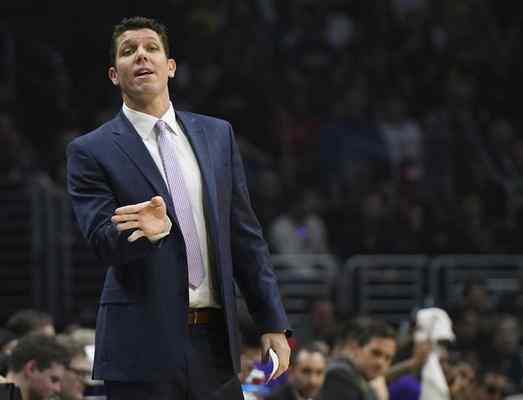 Although he had contended on Tuesday that he had never pondered changing his starting lineup beyond injury and rest purposes, Walton softened his stance on Wednesday. The Lakers have used 14 different starting lineups, though it has always featured Russell, Young, Luol Deng, Randle and Timofey Mozgov when available.